Welcome Home Blog: "Home Is Where The Heart Is"
It's here! My newest cookbook has just been released and is now available only at Blurb.com and soon to be on iTunes. 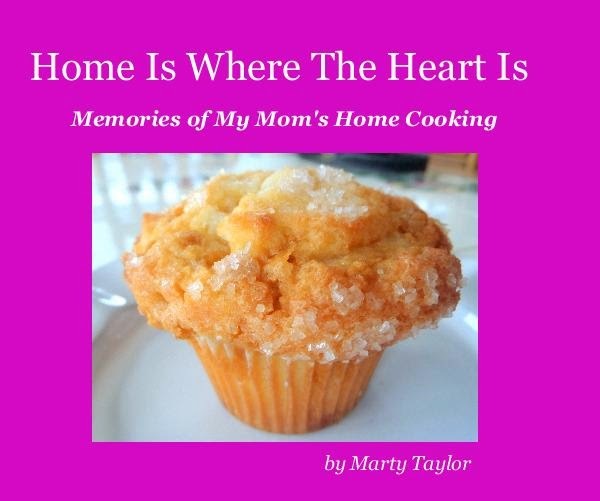 It's called "Home Is Where The Heart Is" and it is a collection of my Mom's favorite recipes. It's a beautiful 100+ page limited edition cookbook with vibrant full page photos to match each completed dish. This is the 5th book in the Welcome Home series. In this book you'll find salads, soups and stews, main dishes and some of her best homemade Pies, Cakes, and other delicious desserts. You can see a free preview of it now on the right side margin where all the other free preview are shown of each of my books. The new book comes in both ebook and print. The ebook is available for downloading as many times as you want to as many devices as you have....desktop or laptop, iPad, iPhone, iPad Touch, or your Android Smartphone. If you buy it now there is an introductory price of only $11.99. You save $10 and you will have it in seconds by clicking on this link....we are standing by to help you if you need us. As with all my books, proceeds from the sale of Home Sweet Home go to saving the lives of dogs and cats who are killed unnecessarily while waiting in kill shelters for someone to come and give them a new home. Over 6 million dogs and cats were killed last year because no one adopted them in time. We can change that. Please help me be the voice for animal rights and help me bring change to this serious issue. Consider your purchase a donation and look at the book as a bonus. Proceeds also go to feed the hungry.